A St. Patrick’s Day themed burrito with corned beef, sauteed cabbage, buttered kimchi, melted cheese and a green tomatillo and avocado salsa grilled to perfection. At some point while planning my St. Patrick’s Day meal I came to realize that St. Patrick’s Day was on a weekday and a particularly busy one at that! I had to change my plans and I decided to go with my all time favourite St. Patrick’s Day meal, the apricot glazed corned beef with sauteed cabbage and colcannon which in addition to being amazingly tasty it is also easy to make since it is a one pot slow cooker recipe. The slow cooker made it perfect for a weekday as you just load it up in the morning, turn it on and it is ready when you get home from work. I ended up making my corned beef dinner a little before St. Patrick’s Day which meant that I got to what I was really after all along, the leftovers, a little earlier! First up on my list of things to try with the leftover corned beef was this corned beef, cabbage and kimchi burrito ispired by Kogi’s stinky leprechaun burrito. In addition to the corned beef, this burrito includes cabbage sauteed with bacon , kimchi , which is a spicy fermented cabbage, onion and cilantro relish , melted cheese and some avocado salsa verde (because it’s green and it’s St. Patrick’s Day). I have to say that this is one fantastic combination of flavours and textures! The slow cooked juicy and tender corned beef works really well in this spicy burrito covered in gooey melted cheese. The kimchi and salsa verde add just the right amount of heat and the sweet and juicy onions help clean the palate leaving you ready for more. I practically inhaled this burrito and now I want another one but it’s time for a slice of Guinness chocolate cheesecake . More experiments with corned beef leftovers coming. While supplies last. Add the kimchi and saute until most of the moisture has evaporated, about 2-3 minutes. Assemble burrito and grill until lightly golden brown, about 2-4 minutes per side. More St Patrick’s Day recipes! 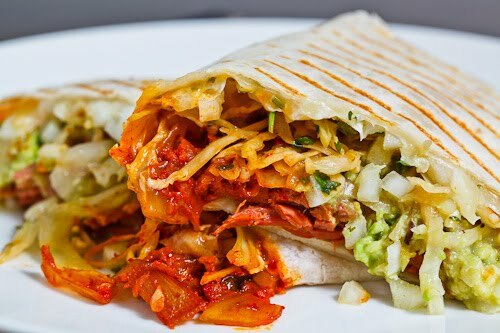 What a great twist on burritos…and kimchi…and corned beef! I love this – the world in your hand. A gorgeous burrito! What an amazing combination. I love how you mixed and matched so many different cultures and flavors in this burrito! Most inventive leftovers ever! Hilarious and delicious! I've a large corned seitan loaf that might need to find its way into a cabbage/kimchi burrito. Really nice meal Kevin. I haven't trim Kimchi before. Interesting spin of some unique flavors. Sounds good. This sounds like a recipe with an identity crisis- but it sounds really amazing! I was looking for a something different and I found it 🙂 The buritto tasted great.